For those of you who aren’t as foundation-savvy as some of us and don’t know what a sill plate is, here’s a quick anatomy lesson. The foundation is made up of 3 separate pours of concrete: the footer, the foundation wall, and the floor. First, the footing is poured and allowed to dry to provide a sturdy base for the rest of the home. Then, the foundation walls are formed directly on top of the footer. Finally, a layer of floor is poured. 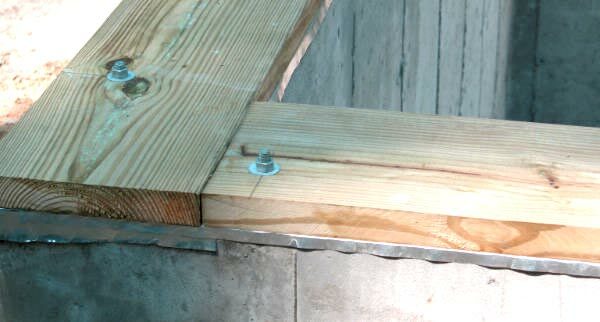 Over time, water can come in quite easily between the joints of the separate sections of concrete. Foundation cracks can also form, allowing moisture and seepage into your home and presenting the need for basement waterproofing. But there is a little known point of entry that doesn’t affect every home; but when it does, you’ll be sure to notice it! Your home’s sill plate is essentially the top of your foundation walls, where the rest of your home sits on top of your foundation. You’ll usually find a piece of treated lumber sitting right on top of your foundation wall, then the rest of your house on top of that. Depending on the build of the home and the conditions of the soil outside, water can come pouring down from the the sill plate over the top of your basement walls; you know, like your own personal waterfall. Cool, huh? This condition can occur when the grade of the soil outside is angled toward your home, allowing water to pool around your foundation; or simply when your foundation walls were poured too low for the grade of the soil and insufficiently sealed, allowing water to squeeze its way through the soil and into that seam. 1. Check the grade of the soil outside. In cases of minor moisture and seepage, grading your soil away from your home outside can often yield great results. If you have to add soil to grade away from the home, pack it down in layers, and try not to cover the sill plate. 2. Seal it up from inside. Although this is not an ideal long term solution, it may just keep your basement dry until you can drum up a permanent fix. Grab a few boxes of masonry caulk from your local home improvement store, and run a thick bead along your sill plate to seal any gaps. 3. Attack it from the outside. If your sill plate is spewing water into your home every time it rains, the options above probably aren’t going to cut it. The third and best option is to address the issue from outside. This generally involves the exterior sealing of the sill plate with waterproofing membrane, along with the installation of drainage tile, to reroute the water away from your foundation. Contact us for more information about foundation repair, and schedule your FREE Inspection.